This free printable certificate is a wonderful way to recognize your worship leader and show him or her how much you appreciate them. It also creates a treasured keepsake memento of one of the most important events in one person's life. The day that you were given this special Worship Leader Certificate will be a day that you will never forget and you will always look back on. This beautiful certificate will help you remember the very date of this very special moment in your life. 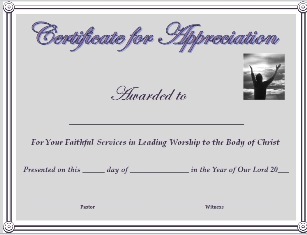 This certificate for appreciation of a worship leader states "Certificate for Appreciation Awarded to [Participant's Name] for your faithful services in leading worship for the body of Christ - Presented on this [Current Date] day of [Current Month] in the year of our Lord 20___ - [Pastor's Signature] - [Witness's Signature]". Do you have one or more worship leaders in your church? If so, your church might want to give them this beautiful certificate to help show them how much you love and appreciate them. Our worship leaders are volunteers who do not receive any payroll, but they are laying up all kinds of treasures in Heaven, which are Treasured by God. If we would sometimes just stop and think of how great Heaven is truly going to be then I believe we would be doing everything humanly possible to make personally sure that we will get there and not miss out. Return to Church Certificates from Certificate for Worship Leader.